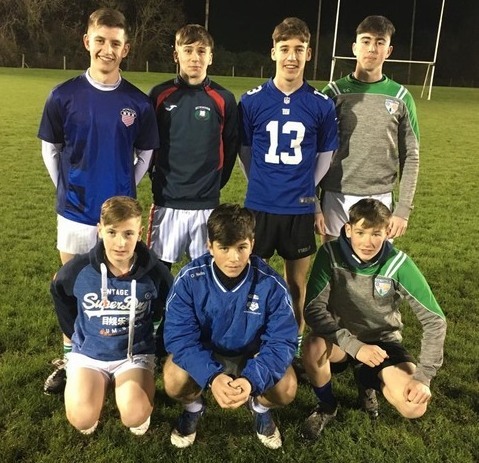 Our inaugural Sean Lavery Memorial Football Tournament, aka “Friday Night Lights” finished up after four weeks in Killeagh on Friday evening last (what a pleasure to be still playing football on the last evening of November) for our U16 and minor footballers. Thankfully, it was a mild and dry evening, and a nice crowd, some having their first look, gathered to watch proceedings. The format for the finals was different from the league games, and it was two straight finals, albeit with a little tweak once again to the scoring format. For the first half of each final (20 minutes), teams were only able to score goals, while full scoring rules applied for the second half. The ‘B’ Final was an extremely close affair, with the Reds and Blues engaged in a ding-dong battle throughout. The Reds were strengthened by Richie Landers’ ‘guest appearance’ as substitute for the injured Adrian Galvin, and he played extremely well throughout, banging in plenty of goals. At half time, the Blues held a slender advantage (5 goals to 4), with Barry Motherway, Jamie Fogarty and Ciaran Leahy very prominent. Tony McCarthy and Cian McDonald were very impressive for the Reds, and the second half continued to be very close, with little between the teams at any stage. With the final whistle looming, the Reds had nudged in front, but the Blues got the final score to win a thrilling match by 11-2 to 11-0. 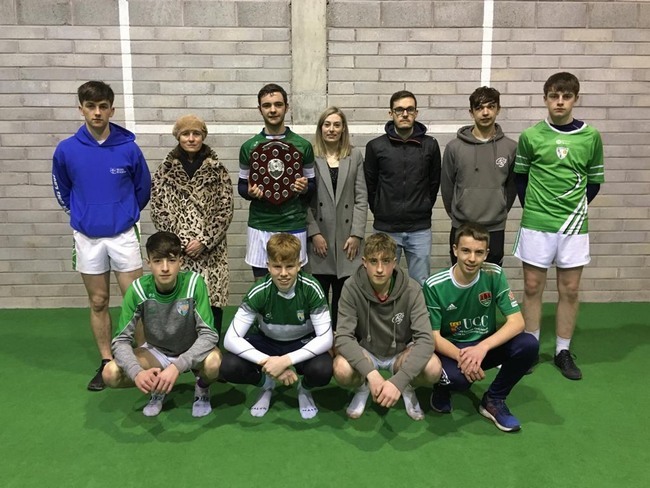 The ‘A’ Final, played for the Sean Lavery Shield, saw end-to-end action from first whistle to last. In the first half, the Greens had five different scorers (Eoin Brenner, Olin Hennessy, Paul Delaney, Oisin McCarthy and Paudie Mackey) and this gave them a 5-2 half-time lead, although the main difference between the two teams was the profligacy of the Yellows in the shooting zone, as they had many shots either well saved by the rotating goalkeeper (Dylan Hogan and Paul Delaney most effective in defence) or ending up inches wide of the target. The Greens started very quickly in the second half and led by 8-5 to 3-0 after eight minutes, and the game looked to be up for the Yellows. However, they battled on, led by captain Kieran Daly, and four quick goals from Kieran and Robert Sinclair brought them right back into contention. At 10-5 to 8-0 with four minutes left, it looked like the Greens had stemmed the tide, but the Yellows put in one last effort and rattled in three more goals to trail by just two points (10-5 to 11-0) with just a minute left. Could they complete an improbable comeback? Not quite, as a George Walsh point and a Paul Delaney goal closed it out for the Greens – winners by 11-6 to 11-0. Great excitement and a fitting end to a thrilling four weeks of action! At this point, everyone returned to our indoor hall where refreshments were provided to all present. Sean Lavery’s family, Mary, Ross and Aisling, had been present from the beginning of the evening to watch the matches, and they presented prizes to all players – gumshields to the runner-up teams and kit bags to the winning teams – as well as the Shield to winning Greens captain Olin Hennessy. Many thanks to all who helped to make this innovative tournament a success – particularly the players, without whose interest it could not have gone ahead. 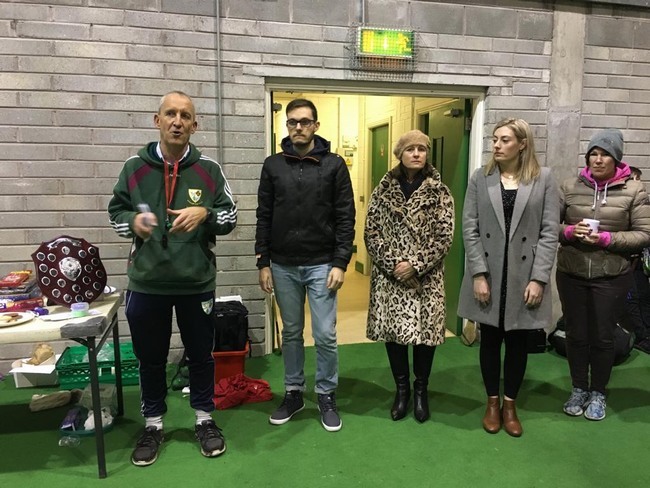 Thanks also to referees Colman Motherway & Johnny Brenner, to Haulie Collins who prepared the pitches in advance each evening, and to Mary Collins for setting up the hall on the final night. 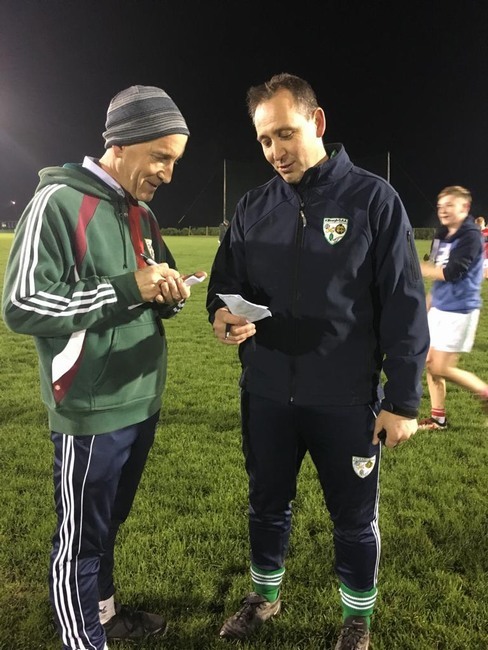 Thanks to everyone who brought food and assisted with catering on the final evening, which overall, was a fitting tribute to Sean both on and off the pitch! 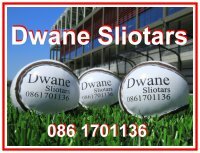 REDS: Adrian Galvin, Andrew Foley, Cathal Fitzgibbon, Cian McDonald, David Collins, Tommy Noonan, Tony McCarthy, Richie Landers. 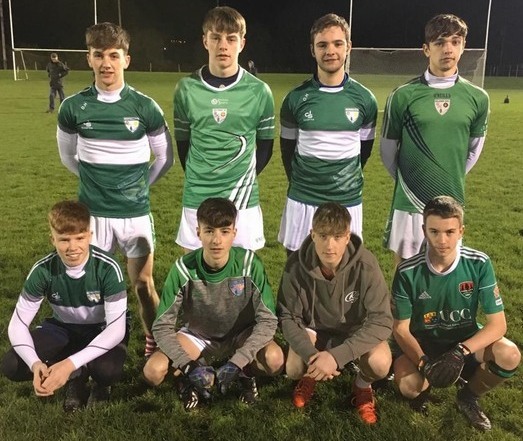 GREENS: Dylan Hogan, Olin Hennessy, Paul Delaney, Danny Cunningham, Oisin McCarthy, George Walsh Wallace, Paudie Mackey, Eoin Brenner. 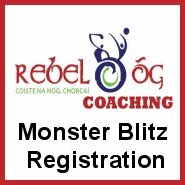 BLUES: Barry Motherway, Darragh O’Connor, Dara Motherway, Owen Cosgrove, Jamie Fogarty, Ciaran Leahy, Remy Bernard, Aaron Fitzgibbon. 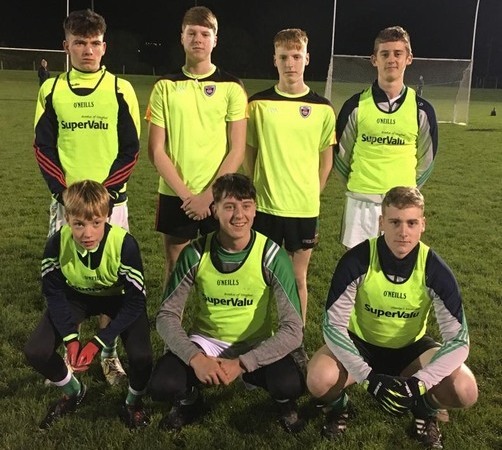 YELLOWS: Kieran Daly, Rob Sinclair, Dan Lucey, George Sinclair, Ciaran O’Rourke, Brian Murphy, Daniel Doherty, Evan Lane. 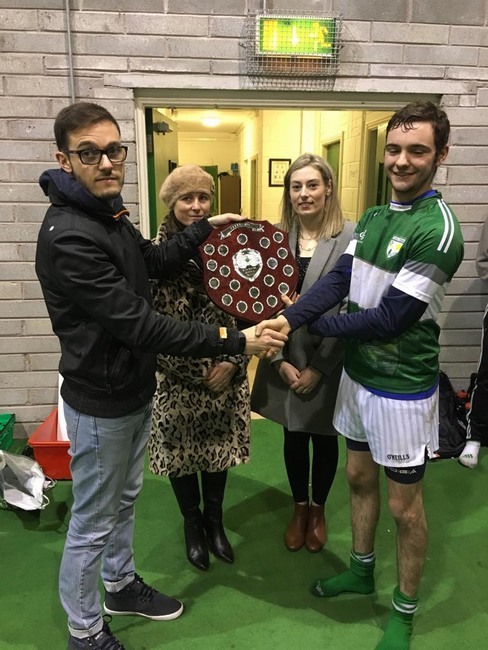 Mary, Ross & Aisling Lavery make the present the winning Green team with the Sean Lavery Shield after defeating the Yellows in a thrilling ‘A’ Final at Páirc Uí Chinnéide last Friday evening. 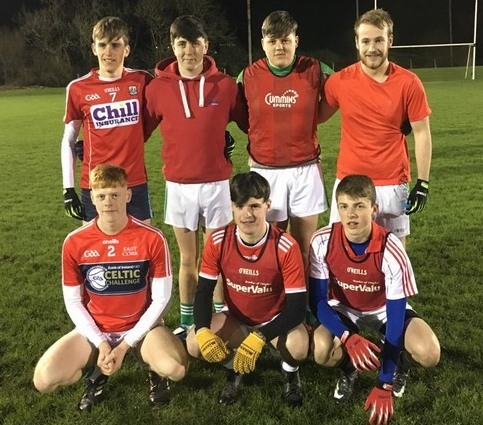 In photo, Left to Right, Back; Dylan Hogan, Mary Lavery, Olin Hennessy (captain), Aisling Lavery, Ross Lavery, Oisin McCarthy & George Walsh Wallace. Front; Paul Delaney, Danny Cunningham, Paudie Mackey & Eoin Brenner.